Jim Gereghty: Tim Scott is the replacement Jim DeMint has asked for. Riehl World News: Jennifer Rubin makes a complete fool of herself. If Nikki Haley appoints Scott, the Graham seat may still be a conservative opportunity. WHY!!!!!! 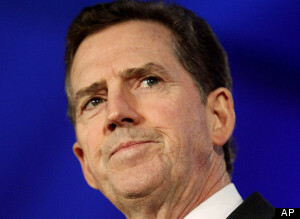 would #Demint leave at most critical time? We need him in the Senate not in another foundation...WTH? What really happened! I will continue to pray for Jim Demint. Pray God continue to order his steps. The causes he supports are still vital in advancing liberty! In the spirit of bipartisanship, nominate Alvin Greene, make some popcorn, and watch the fun. Every time he goes full-idiot, point out that he is a Democrat and that he was South Carolina Democrats' choice for Senate in 2010.